As the world has heard by now, Canada was rocked by two unique, and tragic, events. Last week a soldier was killed in a parking lot hit-and-run in what authorities say was linked to terrorist activity. And of course, just a day ago, Cpl. Nathan Cirillo was shot while standing guard at Ottawa’s National War Memorial, just a few dozen metres from Parliament Hill, in another attack linked terrorist activity, prompting the Prime Minister to cancel Malala Yousafzai’s (Nobel winner) citizenship ceremony. What on earth do these awful events have to do with ethics and conduct in government? Well everything. Ethics refers to the study of right and wrong behaviours. In our daily lives we are constantly faced with important questions about what to do. Should I keep my promise or should I not? Government ethics refers to a professional code of conduct for those working in and for government. Government ethics involves protocols about right and wrong behaviours for many different groups, like elected leaders (Prime Minister and Cabinet Ministers), elected representatives (Members of Parliament), political staff, and public servants. Like in any organization, government employees are faced with many difficult and unique ethical questions. Should elected representatives be allowed to accept expensive gifts from lobby groups? And on the minds of many Canadians right now, when can a public official disclose personal information about citizens?… especially those who have been monitored for possible terrorist links. Ethics identifies what are correct behaviours in different situations and establishes rules of conduct for employees to follow. Canada’s political system only functions properly if its citizens are actively engaged in the democratic process. The same goes for any organizations. It will only function properly if the employees are actively engaged in the business process. And in both examples, if stakeholders came to believe that those in charge were generally unethical or corrupt, they might develop a strong lack of enthusiasm towards their democracy, or organization. This creates a scenario where people withdraw from participating – in government, citizens won’t bother to vote, and in an organization, employees won’t bother to shed light on wrongdoing, both situations resulting in the “why bother, they’re all crooks anyway” comments. Ethics in all organizations ensure that this does not happen. By setting out clear rules that public officials must abide by, and by holding persons accountable when those rules are broken, Canadians can have confidence in their elected representatives and political system – and employees can rest assured that upper management is serious about the important role all employees play in the success of the business. Situations like these horrific attacks, should have organizations ensuring their Code of Conduct and Ethics have been taken off the shelf, dusted off, and revisited. ‘Codes’ are vital for any organization, as breaches of ethics can land companies in hot water with consumers, other organizations, or governments. A Code of Ethics creates a framework upon which all decisions are made. This helps create a cohesive understanding of the boundaries within an organization and the standards set for interacting with external stakeholders. A formal, well-communicated code of ethics can also help to protect a company’s reputation and legal standing in the event of a breach of ethics by individual employees. With a Code of Ethics comes a strong ethics reporting system. This is the place where employees (or the public) can report on any wrongdoing in a safe environment. Just because a Code of Ethics is established doesn’t mean that things are going to sail merrily along with no hiccoughs. Things happen. Incidents will always happen. It’s the nature of being human. It’s what we do after learning about those incidents that builds trust and integrity. Just like an IT professional can report that something seems a little fishy with the sensitive and private data of millions of consumers, the public, and government employees, can shed light on a particular person’s sudden interest in terror groups and concern over their possible deadly actions. Like all reported incidents, that information needs to be taken seriously, investigated, and resolved. Then we need to learn from it, and improve processes to ensure it doesn’t happen again. 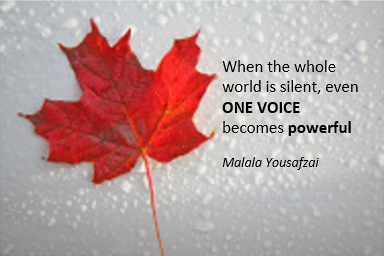 Like Malala’s quote in the image above, all it takes is that one voice to instigate appropriate action. That one voice is your employee who’s stepping out of their comfort zone to report a wrong they see. Click here for global ethics hotline.